Freeway Fury 2 is part 2 of this exciting racing series, developed by Vasco Freitas. This game has simple graphics, suitable for all ages. You can experience this game on your browser because it is a flash game. There are two modes for you: Play Mode and Free Ride Mode. Play Mode is normal mode while Free Ride Mode is new mode. In Free Ride Mode, your task is to unlock special features with XP points. There are 13 special features waiting for you to conquer. Update the new cars, especially the motorcycles. There are many types of motorcycles. Different types of motorcycles will have different speeds. "Jump to other cars" and Nitro are retained in this part 2. 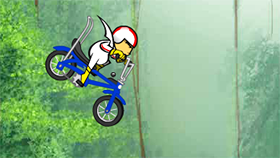 You will also have 60 seconds to complete the race. Each time you jump to other car successfully, you will have 500 points and your nitro bar will increase slightly. If you like this game, you can also play others games with the same game play such as Traffic Car Racing Games, Rival Rush … or you can play the 1st part named FREEWAY FURY. Use Z + arrow keys to jump onto other cars. Use up arrow key to active Nitro. Each time you jump to another car successfully, you will have 500 points. Different cars will have different speeds.